Once I started doing yoga and had to actually breathe in the postures, I realized that I've spent my adult life holding my breath or taking quiet shallow breaths. Breathing deeply is imperative for tissue healing of all sorts, and is instantly calming. That's why when someone's freaking out you always say, "Okay, slow down and take a deep breath"! 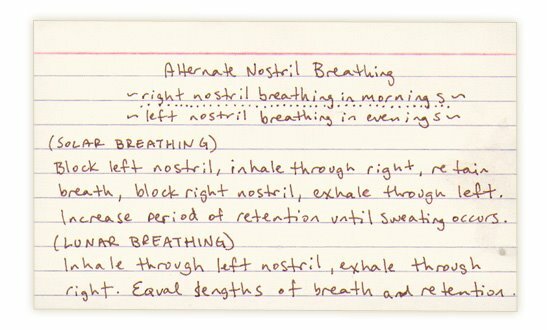 According to Ayurveda, Alternate Nostril Breathing has many physiological benefits, because when you inhale through your left nostril it initiates different healing benefits than your right, and isolating each nostril allows this to happen. 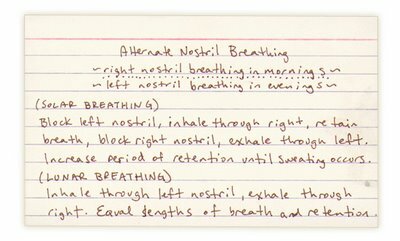 You also have to hold your breath ("retain") after both inhaling and exhaling, and this causes yet other kinds of healing. Performing Alternate Nostril Breathing habitually will provide a well-rounded source of good health and is even said to make you live longer! You'll see that the card has Solar (right nostril) and Lunar (left nostril) breathing. In mornings, cold weather, or if you are suffering from cold-related ailments, perform the heating Solar breathing, which is also recommended for chilly Vatas and Kaphas. At bedtime, in hot weather, or if you are suffering from heat-related ailments, perform the cooling Lunar breathing, which will also soothe fiery Pittas. HOW TO: Sit quietly and comfortably and close your eyes. Rest your right hand on your nose, using your thumb to press your right nostril and your ring finger to press your left nostril. Start by taking 4 seconds to fully inhale, then hold your breath for 3 seconds, and 5 seconds to fully exhale, then hold your breath for 3 seconds again. Focus your attention on the air entering and exiting your body. Repeat this cycle 10 times. Over time, try to gradually increase the amount of time you take to inhale, exhale, and retain your breath.